The report from the House Benghazi Committee discloses a previously unknown but incredibly instructive footnote to the story of the Obama administration's disastrous foreign policy toward Libya's Moammar Gadhafi. The Salafi-jihadist Muslim Brotherhood-inspired groups — whom the U.S. trained, equipped and supported in overthrowing and assassinating Gadhafi — actively participated in the assault and murdered Ambassador Chris Stevens and three other Americans. The history of Libya is clear. Over the course of 40 years, it became isolated from much of the West. U.S. policy — through successive Republican and Democratic administrations — diminished it to pariah status over its state sponsorship of terror. The forces that rescued Americans on Sept. 11, 2012 were not the U.S. military. They were not the militias that overthrew Gadhafi. They were Gadhafi devotees who were loyal to him and to the U.S. government with whom their leader reached a "deal." Where was the American manpower? Indecision and concerns over appearances among politically correct officials in Washington left them rudderless. Rapid deployment personnel didn't move for 13 hours. It should have been an inexcusable embarrassment for the administration, if it was possible for it to experience any sense of shame. Too bad America didn't possess the same foresight when it was provided the choice a year prior between Gadhafi and his Islamist enemies. The U.S. must remember — as the Gadhafi loyalists have and Turkey, Saudi Arabia and Bangladesh are now realizing — that it cannot get into bed with groups affiliated with the jihadist movement. As the House Select Committee on Benghazi memorializes in its report, at least Gadhafi's men upheld their end of the agreement by continuing to recognize and combat the Muslim Brotherhood threat. This is yet another stinging indictment of the Demcratic presumptive Presidency candidate, our very own Hillary Clinton. With her as Commander-in-Chief of the USA, the world will have a distinct problem when it comes to her ability to make snap decisions :she will be a disaster.On the other side of the aisle, Donald Trump would probably order a nuclear response! The world is stuck between a rock and a hard place with the coming US administration. It will be a continuation with"bell's on" of the Obama disaster years. With Europe in the throes of a Brexit disaster which will take time to resolve, we have a Western mess the like of which has not been seen before. Just think of the world as it should have been, without destroying Iraq because of non exisitant WMD's. Life would be without Islam and it's murderous agenda. 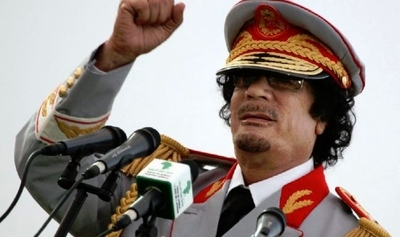 Gadhafi was a "pleasure" to leave alone as was Saddam Hussien! The dangers facing the West for the next four years are to awful to contemplate. Before so called "Arab Spring", Christians had no major problem in Egypt, Iraq, Syria, Lebanon or Libya. I know that for the fact because many Christians were working there and living there. First mistake; Bush getting rid of Sadam, second mistake was Hussein Obama getting rid of Mubarak, Gadhafi and trying to get rid of Asad in Syria. What did the west get? Total disaster and hundred of thousands Christians and Jews being killed. Somebody must be laughing at the stupidity of the western politics. This was a very informative article. I have taught terrorism for several years and I cite Libya and our missteps there as a precursor for the advance of IS and other racial elements. Also we apparently shipped a lot of Libyan weapons to Syria which, to a large degree, fell into the hands of IS and the al Nusra Front. All around, very disappointing result for the US and NATO and most Westerners are unaware of the consequences of such folly. Thanks Pete so much for sharing. This is very insightful and well said.